We have annual training sessions to keep our employees up to date on spill response. We are equipped to handle both marine and land based spills. We can do gasoline and fuel tanker rollovers. We have the training and equipment to provide safe, fast and effective spill response. Sutherland Excavating Ltd. maintains 2 dedicated spill response trailers at Miramichi. These units serve all of New Brunswick. The units consist of absorbents, pumps, booms, 2 boats, skimmers, hoses, generators and air compressors. They are equipped with work lights, hand tools, coveralls, survival suits, protective equipment and all equipment necessary for a remote area response. 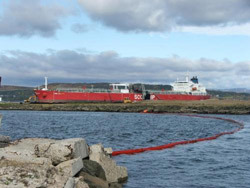 We provide oil spill response training to industrial sites upon request. We are a part of several large industrial customer’s ISO and EMS plans. The best situation for an industrial concern is to contact us before a spill happens so we can be a part of the contingency planning and we can be familiar with the site. Callers should ensure that as much information as possible is included in the notification; however, do not jeopardize personal safety to obtain this information.